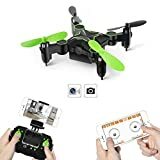 · This pocket folding mini quadcopter could be controlled by the remote controller or APP on smartphone. The folding and flexible aerofoils make the palm-rated drone can be placed convenience. · Streaming images/video in real time: Linking to the wifi drone to control fly and take photos at the same time. · The 2.4GHz remote control frequency will transfer a longer distance and the signal is not easy to interfere. · When you finish playing and take out the battery, as this could protect the quadcopter.